Have you ever gazed longingly at sheds located outside of your local home center or in neighbors' yards? You know that your yard is seriously in need of a dry, organized, and secure place for your garden equipment, tools, and sporting goods, but one look at their high prices might be enough to cause you to put the idea on the back burner. You can build a far cheaper shed from scratch that is attractive and functional and might even be better than the store-bought shed. Eight feet tall at its peak and with an 8-foot by 8-foot footprint, this basic shed saves precious yard space while maximizing interior storage for yard equipment and tools. Gable ends in conjunction with a rafter-and-ridge system lend a classic look to this shed, and its optional tongue-and-groove pine siding can be stained and sealed or left unfinished for a gray, rustic appearance. Protected by three-tab composite shingles or rolled roofing, this shed provides a tight, weatherproof storage area and will last for years to come. Sheds that remain within a certain set of factors often do not require building permits or zoning clearance. 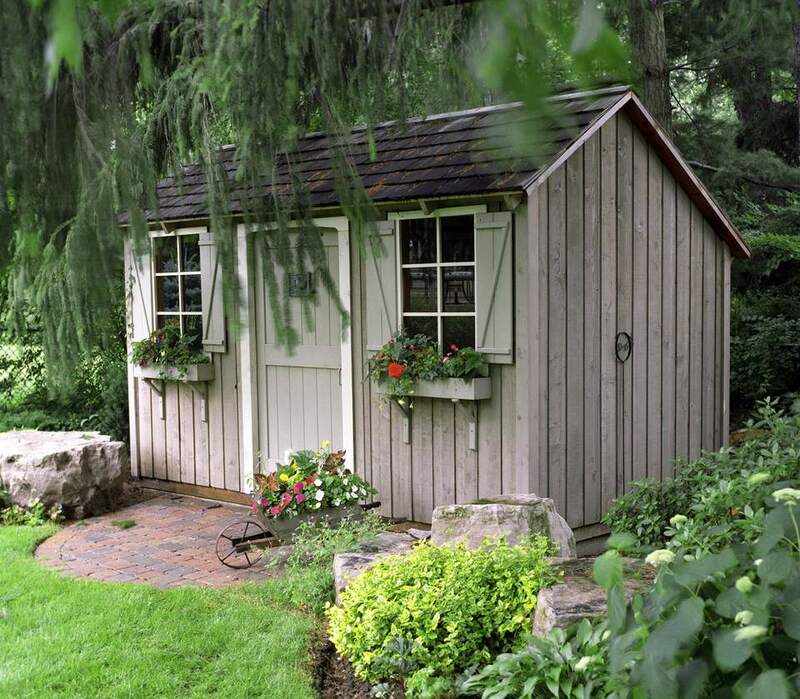 Typically, sheds must not be attached to a home and must stay below a square footage maximum. However, check online or by phone with your local permitting and zoning departments for specifics. If you have questions, do not hesitate to call your local building permit department. Holes will be dug for the footers, so call your local utilities avoidance hotline. These free services will send out a technician to mark your property for electric, sewer, water, or other vital service lines. With the framing hammer and 16d nails, nail four two-by-eights together to form a square shape that measures 8 feet long by 8 feet wide. Use two nails per end. The frame will not hold a perfect square shape at this point. However, do not be concerned as it will later receive floor sheathing, which help it hold its shape. Move the floor frame to the desired shed location. Measure the floor frame for square by measuring across the two diagonals. Gently push the frame into square so that the two diagonal measurements match. Firmly place the four concrete footer blocks in the inside corners of the frame. Drive a wood stake at the outside corner of each of the frame's four corners to establish center points. Remove the frame and blocks. After removing the concrete blocks, dig a hole at each spot about 20 inches by 20 inches by 8 inches deep, using the stake as a center-point reference. Fill each hole with gravel until the gravel reaches ground height. Place the concrete blocks on each gravel bed and level with the bubble level. Double up two opposing sides of the floor frame with a two-by-eight at each side. These act as rim joists to strengthen the two ends of the frame that will carry the weight of the inner joists. Nail into place with the 2 1/2-inch nails. Joists will extend from one rim joist to the opposite rim joist. Mark six locations on each rim joist at 16 inches on-center and install joist hangers at each spot with the 1 1/2-inch nails. Insert six of the pressure-treated two-by-eights into the joist hangers and secure with 1 1/2 nails. Square up the shed floor frame one last time up to a 1/8-inch tolerance level. Install the two OSB sheets on top, perpendicular to the joists. Secure the OSB throughout the perimeter and joists every 8 inches with 1 1/2 inch nails. The two wall sides of the shed with triangular peaks are the gable ends. Because the floor area is 8-foot by 8-foot, this gives you a convenient template for beginning to frame the gable end wall. Lay one two-by-four on edge along one of the sides of the floor frame. Dry-fit two other two-by-fours along the two adjacent sides of the floor, making a U-shape. In the center, dry-fit four more two-by-fours so that they are parallel to the two sides of the U-shape. All two-by-fours should be spaced at 16 inches on-center. Along the top side, lay two more two-by-fours on-end over the top of this assembly, forming a broad obtuse angle, around 150 degrees. Use your Speed Square to confirm the angle. Mark the six two-by-fours that run into this triangle with the pencil. Also, mark the angle on the two two-by-fours that form the triangle. With the miter saw, cut angles on the six vertical two-by-fours and on the two two-by-fours that form the angle. Dry-fit all lumber again and nail into place with 3 1/2-inch nails. Frame the front gable end as you did the back gable end, though with some exceptions to accommodate a door opening. Do not use the two center two-by-fours. Instead, slide them over to double up each of the two two-by-fours that frame the door opening. Also, use two two-by-fours across the top of the door opening to form a door header. Adjust all studs accordingly to fit the pre-built double door. Tip to vertical each of the gable ends and nail to the floor with 3 1/2-inch nails, making sure that the nails penetrate the frame and not just the OSB sheeting. Walls will be framed with four two-by-fours forming a square, with three two-by-fours forming vertical interior studs. Space all boards at 24 inches on-center. Tip the side walls to vertical and nail to the floor frame with 3 1/2-inch nails. Nail the gable ends to the side walls also with 3 1/2-inch nails. Have a helper hold a two-by-eight between the two gable peaks. You should then go to each peak and, from the opposite side, drive 3 1/2-inch nails into the ends of the ridge board. Install five pairs of rafters spaced 16 inches on-center, running from the ridge board to the top plates of the two side walls. Rafters will need to be cut at an angle on each end to meet the ridge board at the top plate. Nail into place and secure with metal hurricane ties. Unlike a roof truss system, which prevents walls from bowing, the simpler ridge-and-rafter system employed here does not do this. To keep the walls from separating, nail three two-by-fours from one side wall to the other side wall. Later, if you wish, these can be used for ceiling storage. The 10 sheets of 1/2-inch OSB sheeting will be dispersed among the four walls and the roof. Each wall will receive two sheets, hung horizontally and nailed into place with 1 1/2-inch nails. The roof will receive two sheets. Before nailing sheathing on the front gable end, mark and cut for the door opening, then install the door. Finish the walls with tongue-and-groove shiplap pine siding installed horizontally. Trim around the door. For extra waterproofing, you may wish to install house wrap or tar paper below the siding. Rolled asphalt roofing, also known as mineral-surfaced roofing (MSR), is easy to install and inexpensive. Start at the bottom, then work upward and overlap sections by 8 inches to 12 inches. For a more attractive look that is a bit more expensive, install three-tab composite shingles.